The Cape Town Big 6 are all located on the West Coast Way Cape Way Route. The six destinations that make up the Cape Town Big 6 are pulling out all the stops for the upcoming summer season running from November until January 2019. Cape Town’s iconic tourism collaboration, formerly known as the Cape Town Big 7, has announced that they have reverted back to the original partnership consisting of six major tourists attractions in Cape Town. 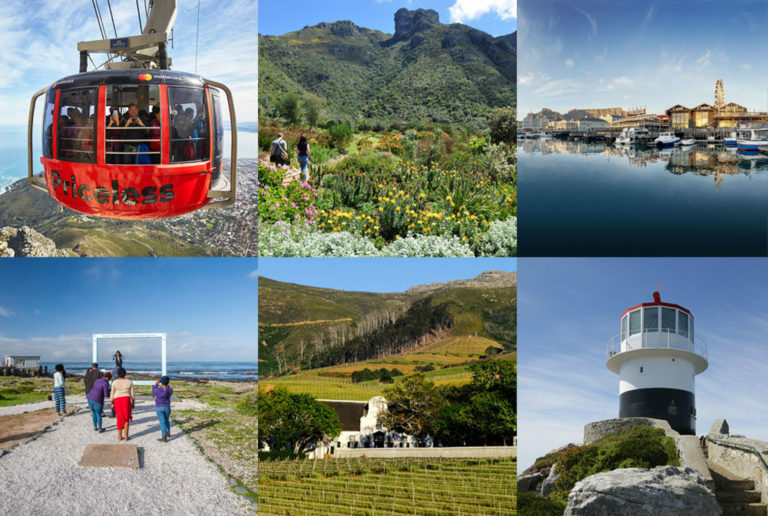 Cape Point, Groot Constantia, Kirstenbosch, Robben Island Museum, Table Mountain Cableway, and the V&A Waterfront make up the new and re-branded Cape Town Big 6. The official launch of the refreshed Cape Town Big 6 took place on World Tourism Day, and to celebrate Tourism Month, the Cape Town Big 6 proudly announced their exciting and jam-packed line-up of events for the coming summer. Good news ahead of what promises to be a busy tourism season! Speaking at the launch, Wahida Parker, managing director of the Table Mountain Cableway reinforced that this is a name change only and not a game change for what are Cape Town’s most renown and loved attractions. “Nothing changes in terms of the wonderful offerings from the Big 6 attractions. We are so blessed – Cape Town has so much to offer, it boggles the mind,” said Parker. The V&A Waterfront will play host to a number of events for the whole family this summer. The launch of a new urban park – called the Battery Park, located on the V&A Canal District will provide families with a 12 000 square metre play area with picnic spots, multi-use sports areas for soccer and basketball, a skateboard park, stand-up paddling and more. Cape Philharmonic Orchestra performing, and the Summer Sessions, presented by Mercedes Benz, which showcase emerging South African artists live at the outdoor Amphitheatre. The Galileo Open Air cinema returns for the movie buffs and the kids will be able to meet and greet Peppa Pig. The Magic of Christmas Show is something for the whole family and sees the Victoria Wharf Shopping Centre light up with festivities. 2018 is then ended off with our annual New Year’s Eve celebration. For more information on the events at the V&A Waterfront visit www.waterfront.co.za/leisure/events/ or contact (021) 408 7600. Groot Constantia Wine Estate is offering visitors a special deal and including their delicious Chocolate and Wine Pairing experience with the Visitors Route Experience for only R155 per person – providing the full taste of wine, chocolate and heritage at South Africa’s oldest wine producing farm. The Visitors Route Experience takes you through the 333-year-old heritage core of Groot Constantia with a Cellar Tour, entrance into the famed Cloete Cellar and Manor House, wine tasting and three entertaining audio tours, one which takes you on a walk through the historical vineyards. Visit www.grootconstantia.co.za for more information or contact (021) 794 5128. Robben Island is extending their boat departure times for summer with boats departing at 9:00,11:00,13:00 and1 5:00. The tour includes a return trip across Table Bay, a visit to the maximum-security prison guided by one of Robben Island’s ex political prisoners, and a bus tour of the island. A visit to Nelson Mandela’s prison cell on Robben Island is a once in a lifetime experience. Visit www.robben-island.org.zafor more information or contact (021) 413 4200. The Table Mountain Cableway invites locals to be dazzled by the incredible African sunset views from on top of the mountain with their annual ½ price Sunset Special. An experience that is best shared with your loved ones, friends and family, the Sunset Special is a must-do this summer. To book your half-price return ticket simply produce your valid SA ID at the Cableway’s Ticket Office or provide your details when booking online. The Sunset Specials runs from 1 November until 28 February (excluding 20 December – 2 January) and is valid from 6pm each evening. For more information, visit www.tablemountain.netor contact (021) 424 0015. The Kirstenbosch Botanical Garden will play host to the hugely popular annual Summer Sunset Concerts.The concerts run from 8 November 2018 to 31 March 2019. Gates open at 16h00, and concert start times vary between 17h00 and 17h30. Ticket Sales will open from 1 October on Webtickets and prices range between R190 and R350 for adults with a special Youth Ticket (6-21 years) on offer. For more information and to book visit www.webtickets.co.za or contact (021) 799 8783. Cape Point is offering half-price specials to South Africans from 1 November. Locals will only pay R76 entry instead of R147 upon showing their SA ID. A picnic or braai on the beach, a ride on the only funicular in Africa, a mouth-watering meal at the Two Oceans Restaurant or even just taking in the breath-taking views from the old lighthouse are just some of the many things visitors can experience at this iconic attraction at the tip of the peninsula. For more information visit www.capepoint.co.zaor contact (021) 780 9010. We are extremely excited about the Cape Town Big 6 upcoming summer. There is renewed vigour in our tourism sector thanks to the wonderful rains we have had. Cape Town has reaffirmed itself as the destination of choice for the upcoming holiday season, concludes Parker. For more information on the Cape Town Big 6 and the events on offer through the summer season, visit www.CTBig6.co.za or follow them on Twitter, Instagram and Facebook @CTBig6.